I received FOUR large bags of popcorn from G.H. Cretors! Two bags of their Simply Salted Organic Popped Popcorn and two bags of their Extra Virgin Olive Oil Organic Popped Popcorn. ALL FOUR BAGS are GONE! GONE, I tell ya! I was trying to take pictures for this post and kept eating what I poured in the basket. LOL I was praying and hoping I would have pictures to show you! I did not know ORGANIC could taste this good. I didn't know popcorn could taste this good! Can you tell how impressed I am? Throw away the Orville Redenbacher! Throw away the Pop Secret and any other brands you may have! THIS brand is the ticket! Do I still have to do a review? Of course! Let me get to it. The G.H. Cretors family INVENTED the popcorn machine! I did not know that. There's a wonderful video on their website. They've been in business since 1885 and they make all of their popcorn in small batches. The inner lining of the popcorn bag is like a foil and keeps everything fresh. I loved BOTH flavors that were sent to me. Their popcorn is so light, you could eat an entire bag in one sitting! The popcorn wasn't heavily salted (I hate that). The olive oil was not heavy WHATSOEVER! Everything was LIGHT, FLUFFY & TASTY! No greasy fingers! No oiliness! Oh wait! And get this...NO PILE OF UN-POPPED KERNELS AT THE BOTTOM OF THE BAG! Several years ago, I cracked a back tooth on a kernel! A cracked tooth with exposed nerve is NO JOKE! I wouldn't wish it on anyone. So I'm so glad these are fully popped. This popcorn is fabulous. It's off the chart's supersweet and you guys know how picky I am! 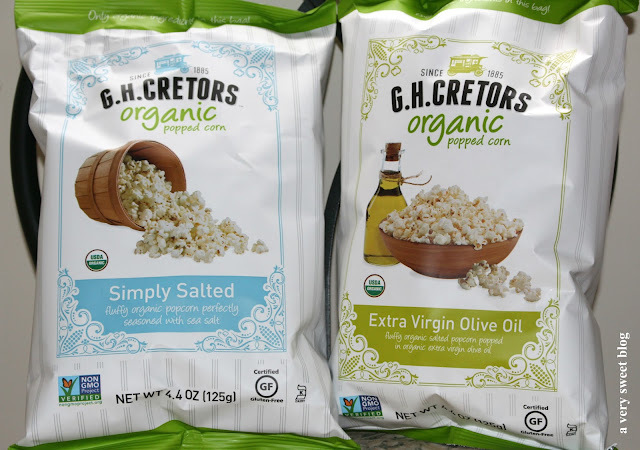 These are the only organic flavors they have, but they do have regular (should I even call their popcorn regular) popcorn flavors, such as Chicago Mix (they're out of Illinois), Just The Cheese, Just The Carmel Corn, and they have a Sampler Pack if you can't decide. Go to 'Store Locator' and locate where you can find this brand. Cause it's super delicious. You can also order online. 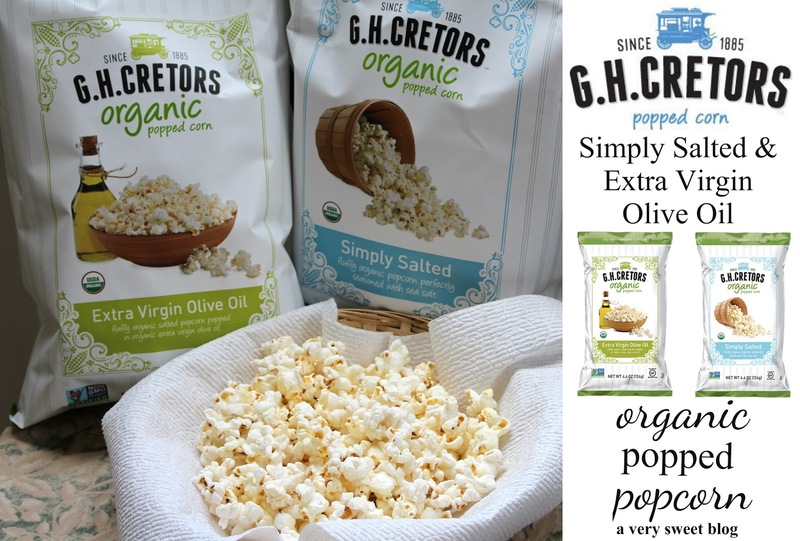 Their organic line of popcorn features only organic non-GMO popcorn, 100% organic oils, and pure sea salt. They're also Kosher! I'm so glad I tried this fabulous brand. This has taught me that not all popcorn is popped equal (or tastes equal)! LOL Have a poppin' day everybody! Popcorn and a movie, it cant get better than that. I always get some when I go to the movies (which hasn't happened in ages), but the store bought was always disappointing. These sound delicious!I would love to try the ones with Extra Virgin Olive Oil. Definitely want to try these! You got my attention Organic and the one with extra virgin olive oil sound delish great review. I'm a fan of popcorn and finding ones that taste good and are fully popped can be a challenged. This brand sounds really terrific and it's cool that they carry such a fun range of flavors. I'll definitely have to see where they're available in NYC! Everything organic? Sounds great! Salted popcorn is not my fave one but I really enjoy popcorn (and nachos) while watching movies! It's totally a must! ;-DD Hope you back tooth is ok now?! Popcorn is my favorite snack Kim!! These sounds so good and that's awesome they are organic! All the flavors sound delicious! ooo popcorn with olive oil sounds so good! These sounds so good Kim! The only time I eat popcorn is at the theatre. I'm not a popcorn fan. Just wanted to let you know about another Chinese superstition Kim. You know how I mentioned on my blog that my cousin is getting married this weekend. Anyway, my aunt did not invite my sister (the one who had a baby recently). Traditionally, two happy occasions (wedding and new baby) cannot collide, so my sister have to stay home. Sad, isn't it? Just wanted to share with you. Anyway, have a great week my dear friend! hmmm who doesn't love popcorn nom nom! I love love love popcorn and these sound delicious!! Oh yum I love popcorn! And now I want some, haha! A few years ago there was a farmer's market out the front of the office every week, there was a guy who made the BEST popcorn. I still have very fond memories of it, even after we relocated away from the markets to another building. It was just SO GOOD! Mmm olive oil and salt sound like a perfect and delicious popcorn combination! Thanks for the recommendation! 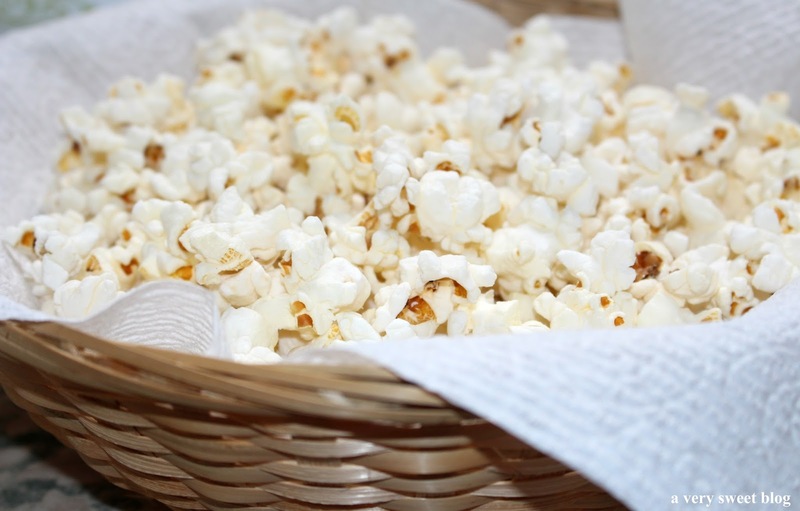 We LOVE popcorn and it can be so stale in the package so I'd love to check this out! they look so yummy!!! good job you did not eat them all before the photo shooting was over because they look delicious! I love pop corn! I see this brand every time I do groceries shopping but never thought of trying one! Will definitely pick up a couple to try this weekend! Hi Kim! I came back to enter the giveaway. My daughter has multiple allergies and cannot have butter. It looks like the EXTRA VIRGIN OLIVE OIL would be perfect for her. I cannot believe you did not take pictures of you with your shoes off, sitting on the couch, and enjoying these goodies! OMG Kim I saw these in the store, and they looked good! I don't eat popcorn much, but ever since Kyle has been working at Whole Foods, he wants to eat healthier so I will have to pick some up for him. Awesome review! These sound divine! I just learned how to pop popcorn on the stove last year after growing up in the microwave generation. I love being able to season it how we want it. I've not heard of this brand before, but I love popcorn, and usually put coconut oil or olive oil on it. It sounds great, most especially since you said there's no un-popped kernels at the bottom, that always get me, haha. :) Thanks for sharing. I use to work at a movie theater and every Friday night this guy would come in and buy a big tub of pop corn TO GO. He just loved it. But it was not particularly healthy. This sounds I have seen this before but never tried it. I will have to soon. This popcorn looks so healthy and yummy too. My goodness you make me want to run and grab a few bags to munch on. I eat popcorn from time to time but i don't like those with a lot of butter on them. The healthier alternatives that are available on the market are pretty good. I must check this brand out. Thank you for the review Kim. i love popcorn. and yes, biting on that unexpected unpopped kernel is baaad!